“The centerpiece of this set is the American soprano Helen Traubel, and she is more than worthy of such attention. Somewhat overshadowed, both in her time and in the recorded history of Wagnerian sopranos by Leider, Flagstad, Lawrence, and Nilsson, Traubel was unquestionably one of the glories of the middle of the 20th century. She was not a great actress, either with her body or her voice; she had more than occasional trouble with the very top of her voice, and she was not quite as imaginative as the others in terms of dynamic shading. What she did have was a voice of quite remarkable beauty, with a richness of color and vibrancy that perhaps only Leider matched. Except for the top C (and occasionally B) the voice was an evenly produced column of glowing sound, with no thinning out in the lower and mid-lower register. It retained its beauty certainly up to the top B-flat. Traubel had a sound unlike any other, a vocal glamour of the kind that Wagner lovers very rarely hear. The third act of DIE WALKURE was recorded in its entirety with these forces two days after the concert performance of November 25, 1945 that is also reproduced here (with a different Sieglinde). But the New York Philharmonic, allegedly under pressure from the broadcasting network to shorten the program, made a number of cuts (or told Rodzinski to). These cuts are not duplicated in the Columbia studio recording. Immortal Performances’ Richard Caniell has seamlessly restored those missing passages (he describes which ones in his notes), so we get the entire third act here with all of the same performers. 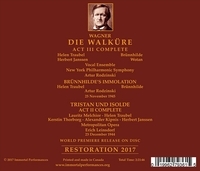 As good as Columbia’s studio recording is (it was famous not only because of its quality, but because it was the first-ever recording of the third act of DIE WALKURE), there is an intensity in both Traubel’s and Janssen’s singing in the concert setting that is not duplicated in the studio. The same can be said for Rodzinski’s conducting. To be fair, one does not turn to either of these performances to discover new musical or dramatic insights from the podium. Bodanzky, Reiner, and Szell, among others, brought a wider range of intensity and musical expression. That is not to say, however, that Rodzinski is routine or without merit, simply that he was not, at least as heard here, operating in uniquely rarified air. His conducting is incisive, propulsive, and well-paced. Occasionally he rises above the level I would describe as quite good and finds real drama, but the ‘Magic Fire Music’ is rather prosaic. Leinsdorf is not as his best in the TRISTAN, either, but he too has a few great moments. The end of Alexander Kipnis’ stunning performance of King Marke’s monologue is one such moment. Leinsdorf seems to pick up the heartbreak portrayed by the singer and reflects it in his shaping of the music. As for the other singers, there are finer examples of Janssen’s Wotan and Melchior’s Tristan to be found in other live performances (also issued by Immortal Performances), but that isn’t to shortchange the value of their contributions here. Janssen was an extremely intelligent and sensitive Wotan, and in the climactic confrontation and farewell with Brunnhilde we hear a specificity of inflection that is quite rare. Like Kipnis, Janssen makes clear the heartbreak that Wotan feels in having to punish his daughter, whose action he totally understands and sympathizes with. Melchior was, of course, the finest Tristan since the beginning of recordings. Vocal beauty, stamina, and much more dramatic sensitivity than he was usually credited with, all are here in abundance, even if this performance is a little less strongly inflected than some of his other recorded readings. Doris Doree, by the way, is a fine Sieglinde in the first scene from the third act of WALKURE. In the TRISTAN we have memorable performances from not only Kipnis but also from Kerstin Thorborg as Brangane. The TRISTAN is, I believe, a first-ever release. The entire broadcast from December 23, 1944, has always been thought to be lost. Somehow Caniell located the second act in a private collection. The basic sound is very good, especially after his usual expert restoration work. The richness of Traubel’s voice comes ringing through, and this is one of the better examples of Melchior’s sound as well. Because Traubel made only a small number of commercial recordings, and because some of her live performances have been released with wretched sound quality (on labels such as Gramofono 2000), many listeners are not fully aware of the unique beauty of her singing. Although she omits Isolde’s high Cs in the TRISTAN, Traubel still thrills with her power and consistency in both roles. One of the great attributes of Traubel’s soprano was that it never lost its richness even at the softest dynamics. Some singers, in order to produce a real piano, have to thin the tone; Traubel had the ability to retain the same vibrancy of tone at all dynamic levels. 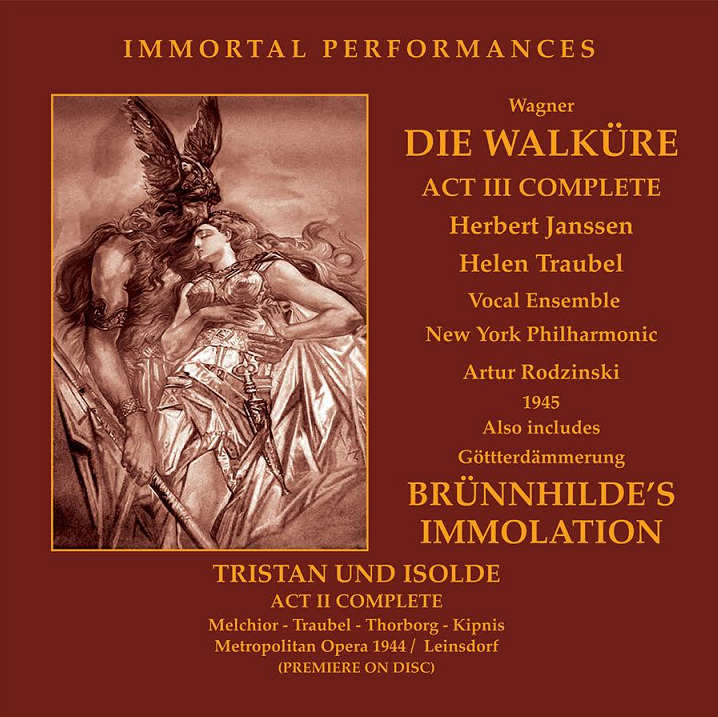 As a bonus we get Brunnhilde’s ‘Immolation Scene’ which is magisterial, from the same concert as DIE WALKURE. Traubel's famous RCA recording with Toscanini has been a collector’s favorite, and rightly so. But the voice sounds better here without the close miking of the RCA engineers. There is also a live Carnegie Hall broadcast with Toscanini that has been issued by Immortal Performances; it is certainly thrilling, but for actual vocal glory Traubel surpasses herself here. If you were to dream of an ideal sound for Isolde and Brunnhilde, hers is what you would create in your mind’s ear. “A new release by Immortal Performances showcases the great American Wagnerian soprano Helen Traubel. Traubel made her Met debut on May 12, 1937, as Mary Rutledge in Walter Damrosch’s MAN WITHOUT A COUNTRY. With the exception of that opera, and four performances as the Marschallin in Richard Strauss’ DER ROSENKAVALIER, the remainder of Traubel’s Met repertoire was devoted exclusively to the works of Richard Wagner. A statuesque woman with a voice of extraordinary depth, warmth, and power, Traubel emerged as the natural successor to Kirsten Flagstad, when World War II led to the Norwegian soprano’s departure from the United States. Although the upper register was not the consistently strongest weapon in her arsenal, at her best, Traubel was every bit Flagstad’s vocal equal. And the performances featured on the Immortal Performances set indeed present Helen Traubel in sterling form. First are two excerpts from a November 25, 1945 concert at Carnegie Hall, of portions of Wagner’s DER RING DES NIBELUNGEN, with Artur Rodzinski conducting the New York Philharmonic. In addition to a trio of orchestral excerpts, the concert featured Act III of DIE WALKURE and Brunnhilde’s ‘Immolation Scene’ from GOTTERDAMMERUNG. 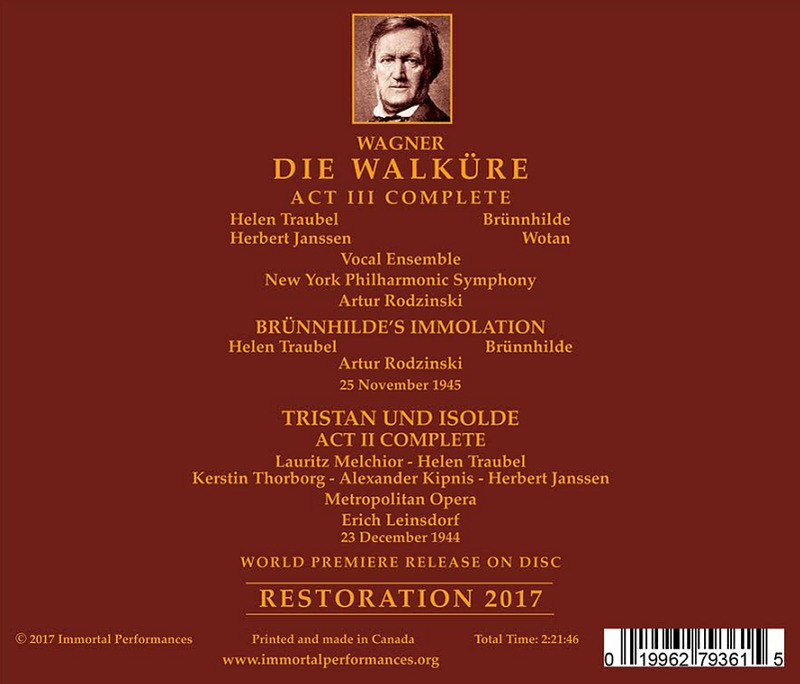 Within a few days after the concert, Columbia Records made a studio recording of the WALKURE Act III (in which Irene Jessner replaced Doris Doree as Sieglinde). While the studio recording is uncut, the concert performance featured numerous excisions to Wagner’s score. Richard Caniell and Immortal Performances used the studio recording to fill in the missing sections, thereby converting the concert performance into a complete representation of Wagner’s artistic intent. The combination of the live and studio efforts is convincingly achieved, and allows the listener to hear the entire act III with essentially the same cast. In both the WALKURE and GOTTERDAMMERUNG excerpts, Rodzinski favoring extremely brisk tempos, secures brilliant playing from the New York Philharmonic. The results are thrilling on their own terms, but I think there is a great deal more warmth and eloquence to be mined from this music, both in terms of breadth and flexibility of phrasing, and rich orchestral sonorities. If, however, you like Wagner on the fleet, propulsive side, there is much to enjoy. Traubel is in superb voice for both selections. While never the most subtle or specific of interpreters, Traubel is totally convincing in her portrayal of Brunnhilde’s desperation to rescue Sieglinde, and in the extended dialogue/debate with her father, Wotan. The latter is sung by Herbert Janssen, also in first-rate vocal form, and exhibiting the warmth of voice and character that were the essence of the German bass-baritone’s art. If Janssen is more convincing in portraying Wotan’s love for Brunnhilde than his anger toward her transgressions, that is a product both of this artist’s predilections, and perhaps even Wagner’s own musical and textual depiction of a complex figure. Janssen rises to the occasion to deliver a majestic Wotan’s Farewell, as does Traubel with the ‘Immolation Scene’, thrilling in every respect. Even if you already own Traubel’s 1941 RCA studio version with Toscanini and the NBC SO, or its companion live performance (beautifully restored by Immortal Performances), this 1945 version is well worth hearing. The broadcast sound is excellent, on a par with studio recordings of the time. Doris Doree is quite moving in her brief but important appearance as Sieglinde in the WALKURE excerpt. The December 23, 1944 Metropolitan Opera broadcast of Wagner’s TRISTAN UND ISOLDE has long been presumed lost. However, Immortal Performances recently discovered the broadcast’s Act II, in good sound. Thanks to Richard Caniell’s restorative work, it emerges as a near sonic equal to the 1945 New York Philharmonic excerpts. The principals are all Met legends, and supreme exponents of their respective roles - Traubel (Isolde), Lauritz Melchior (Tristan), Kerstin Thorborg (Brangane), and Alexander Kipnis (King Mark). Erich Leinsdorf is the conductor, as he was from the February 6, 1943 Met broadcast, featuring those same singers, and available in complete form. In truth, the quality of the singing and performance trajectory is quite similar in both versions, which is to say excellent. Indeed, of a golden age the likes of which we are unlikely to encounter again. And so, I used the new Immortal Performances version as an opportunity to relish the remarkably youthful, fresh vocalism of Melchior, 54 at the time of the performance and three decades into his professional career, the better part of which involved singing the most demanding heroic tenor roles. Melchior here sounds like a tenor at the height of his youthful powers, but one who is also able to apply a lifetime of experience to his interpretation of Tristan. He and Traubel (also in sumptuous voice) conjure magic in duets, their rich voices blending seamlessly, often in hushed dynamics. Thorborg is radiant as well, and Brangane’s ‘Watch’ soars effortlessly over the orchestra. Kipnis, one of the most glorious lyric bassos of the 20th century, is a far more emotionally involved King Marke than is the norm. It’s a shame that he and the other singers are victimized by the cuts to Wagner’s score that were the Met’s practice at the time. But what remains is breathtaking. Leinsdorf expertly shepherds the singers and orchestra, allowing the music to ebb and flow without any suspicion of haste or delay. Let’s hope that, someday, the other two acts from this broadcast will see the light of day.